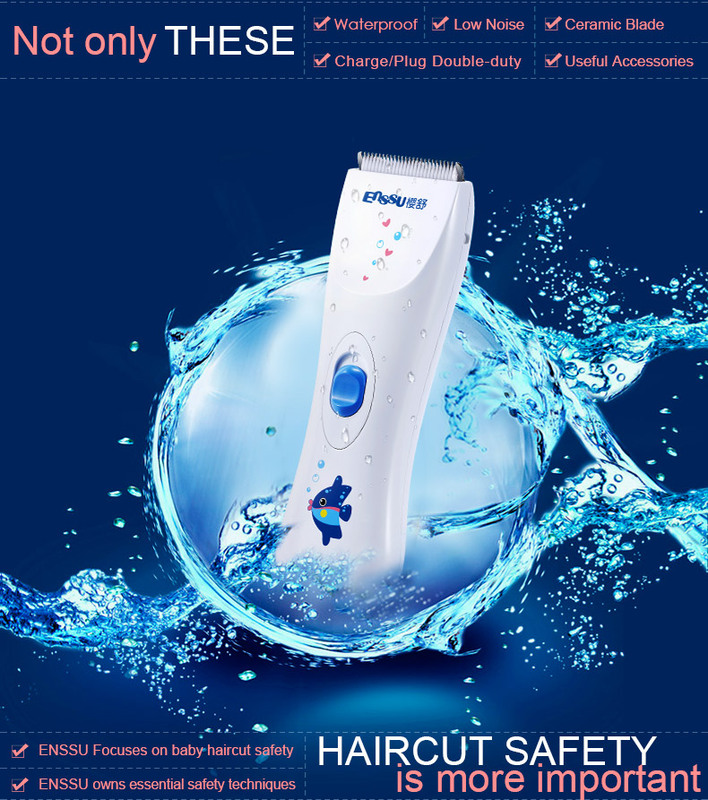 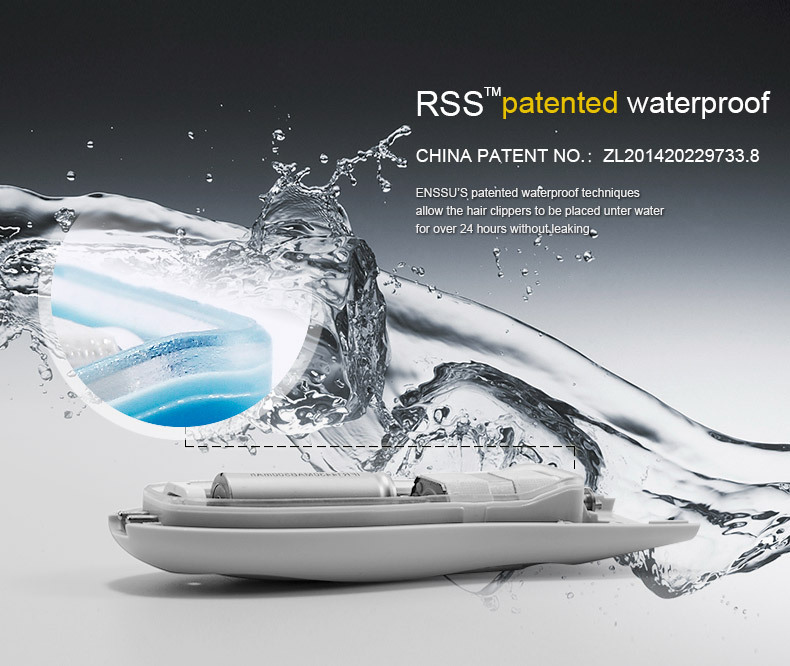 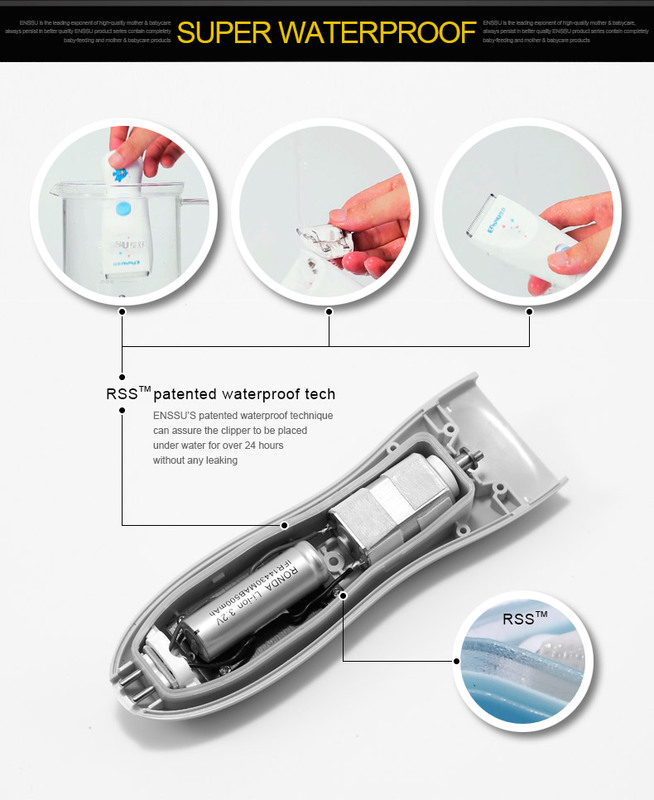 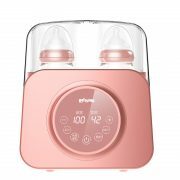 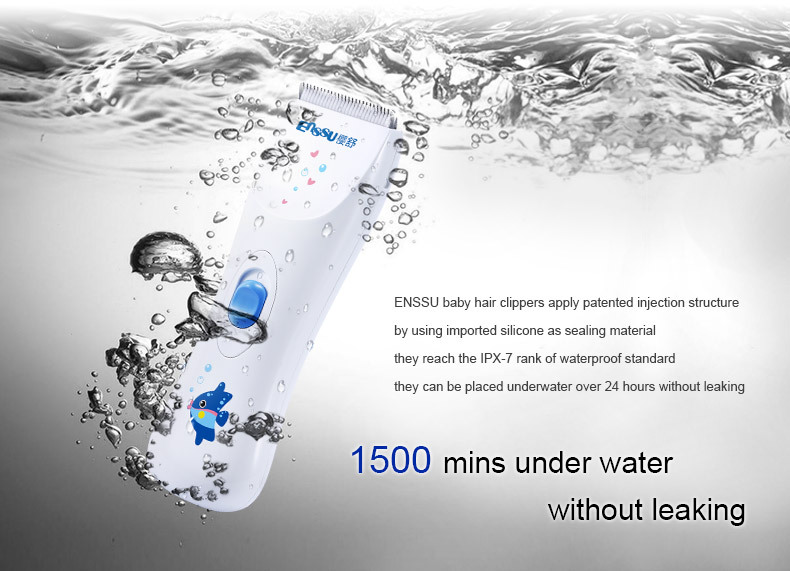 Safe and easy to use, boasts of the strengthened water-proof treatment to IPX-7 level, so that it could be cleaned and at the same time work normally when its body is dipped in water, thus easier to tidy up the broken hairs. 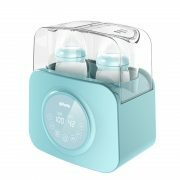 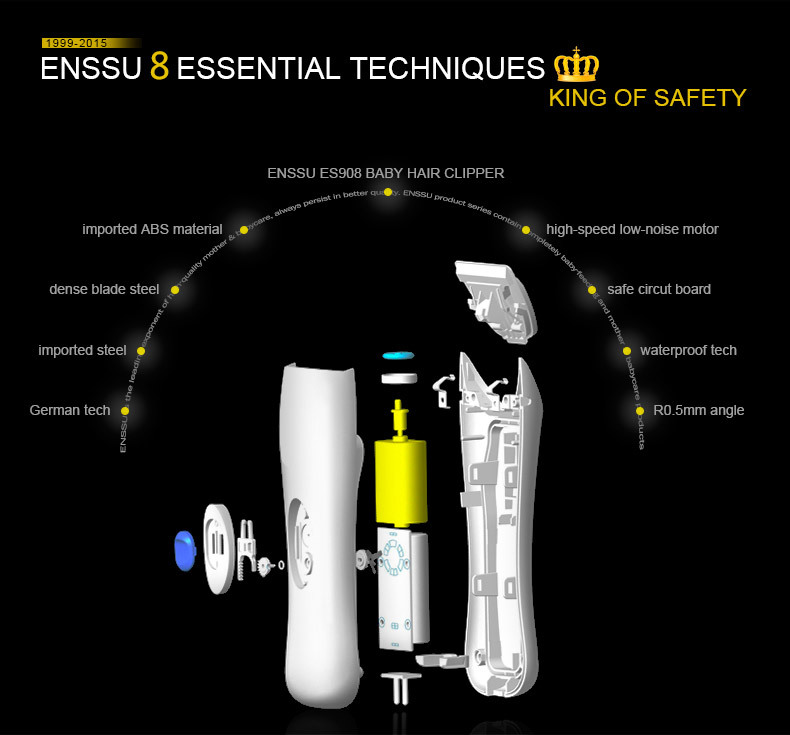 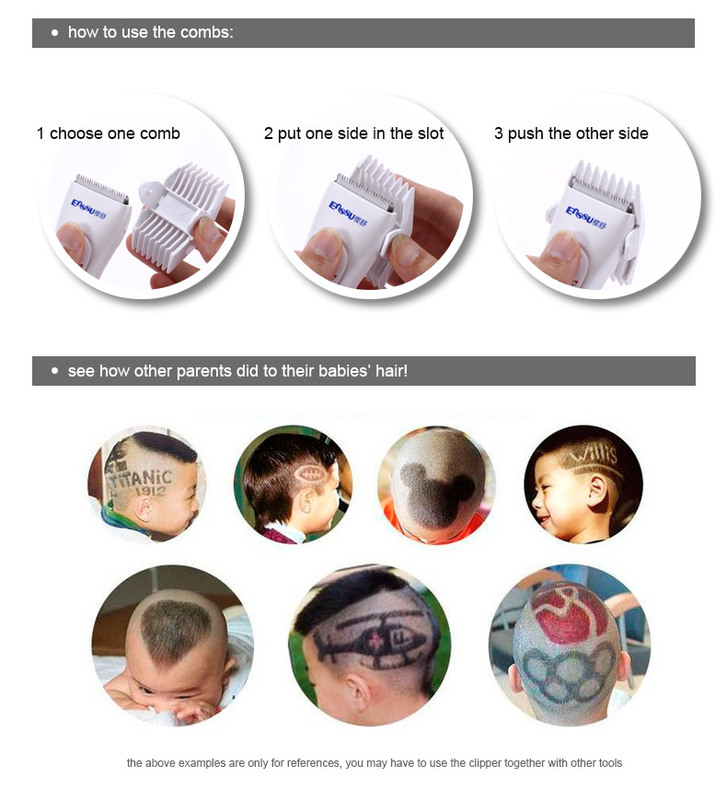 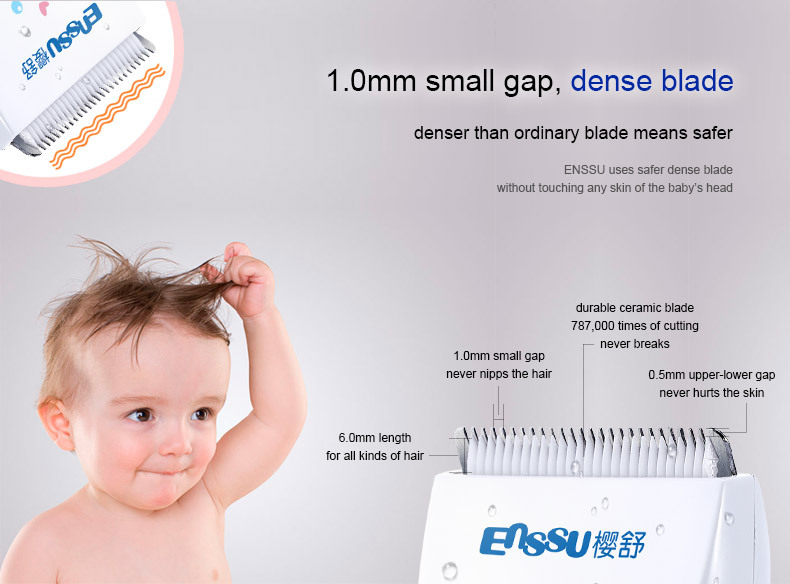 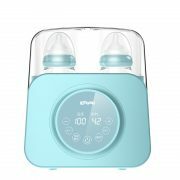 Quiet technique is adopted that could free it from work noise with only about 40 db, making the babies no fear to the hair-cut.The dismountable and washable ceramic blade exclusive to the infants makes it convenient for cleaning. 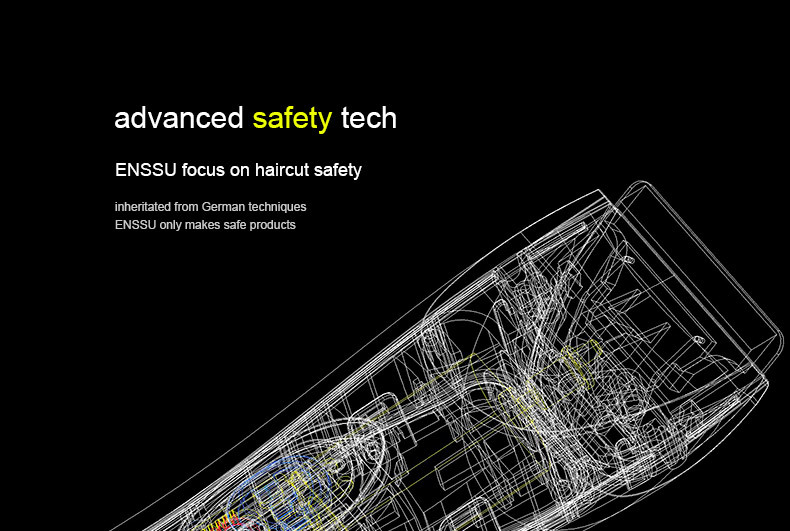 And the safe serrations adopted make it possible for the hair not being nipped. 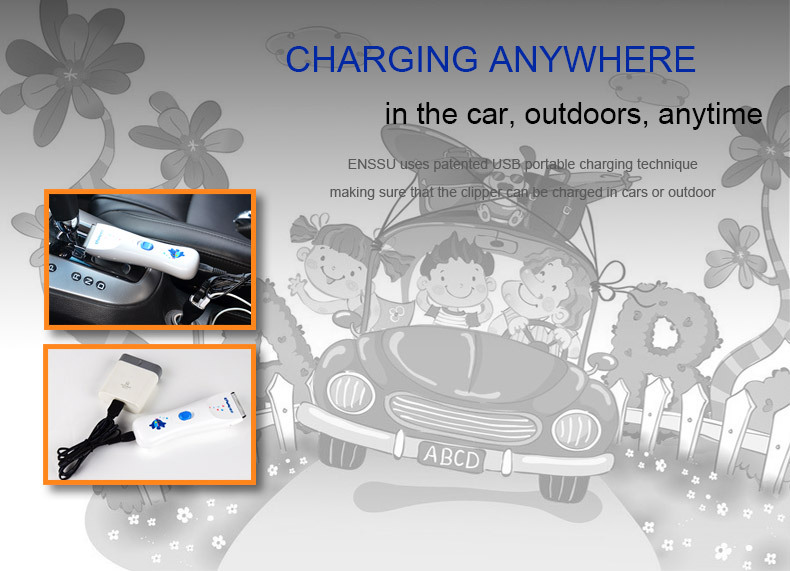 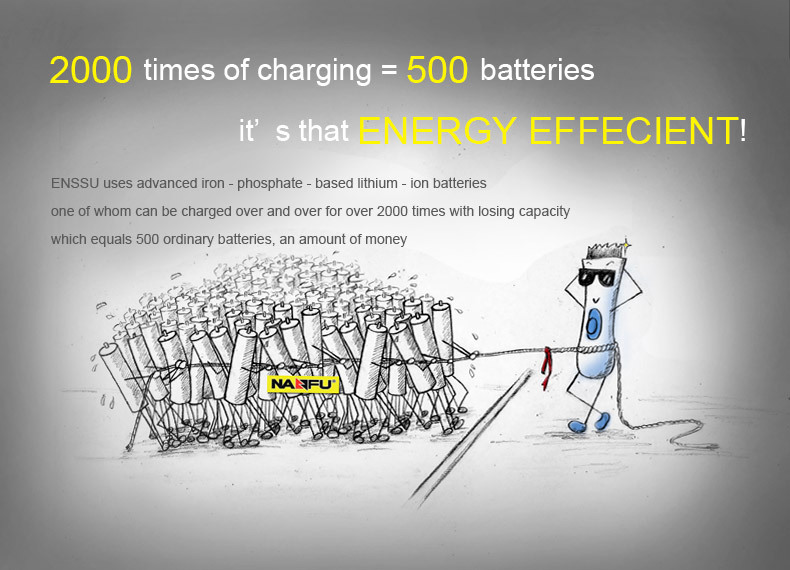 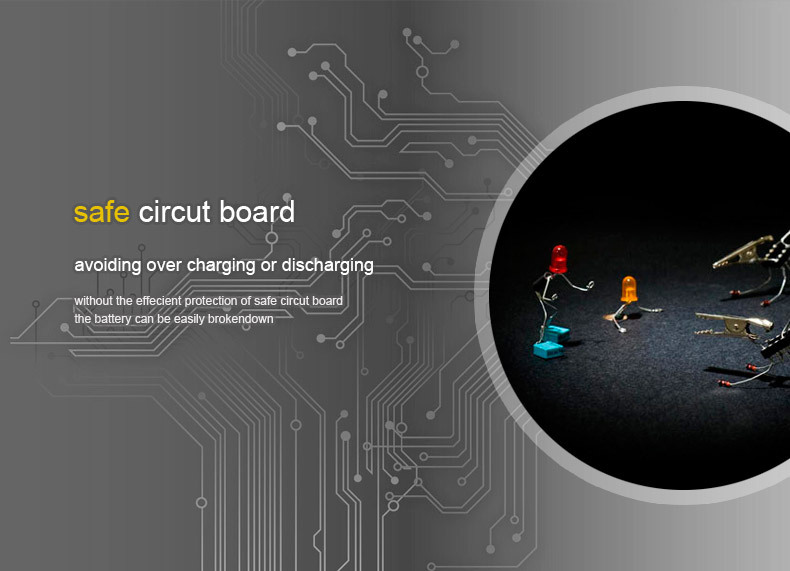 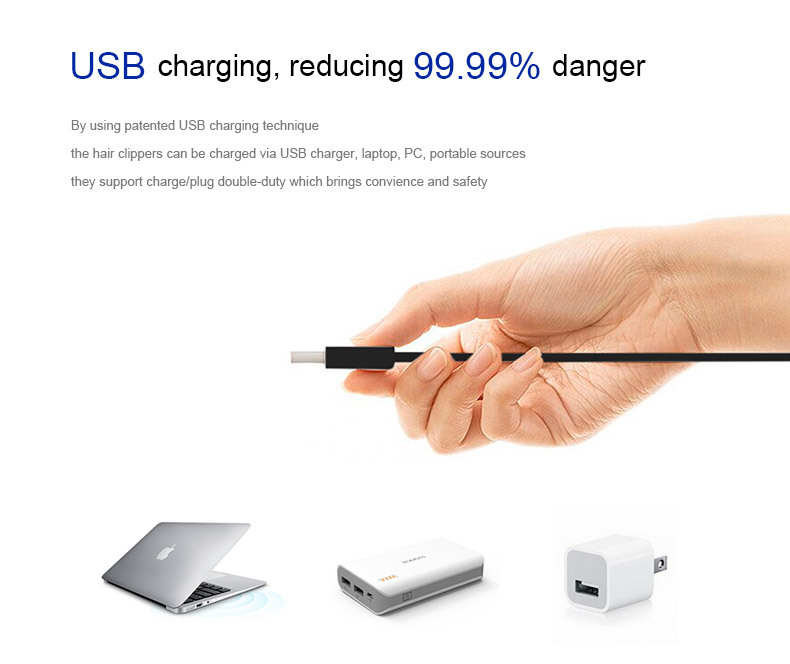 The safety of the charging process is ensured which is charged by USB interface. 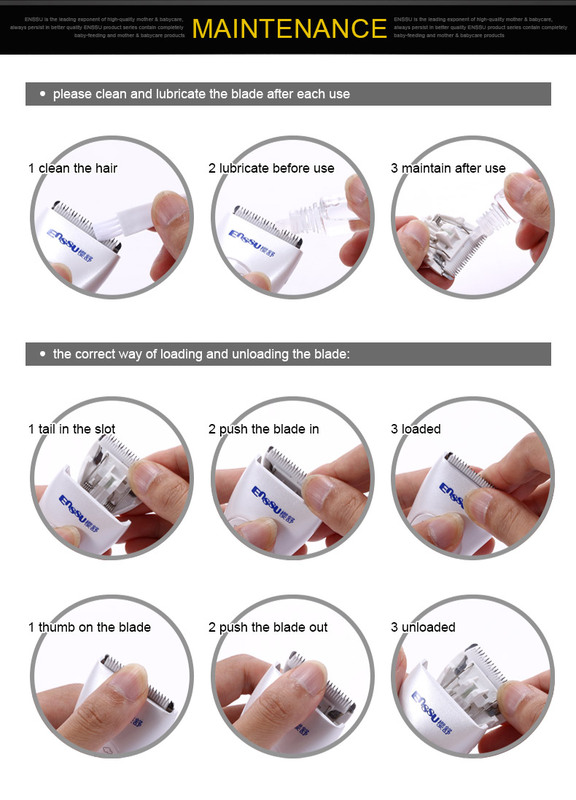 Come with 2 attachment guide combs: 3/6mm, 9/12mm.In order to cut hair with no fear of making mistakes and make the trimmed hair style look natural.In addition with multiple cutting model, making it easy to cut special models. 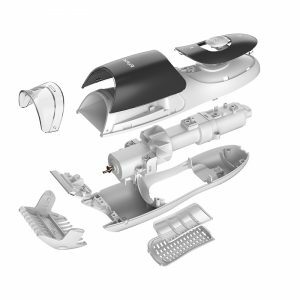 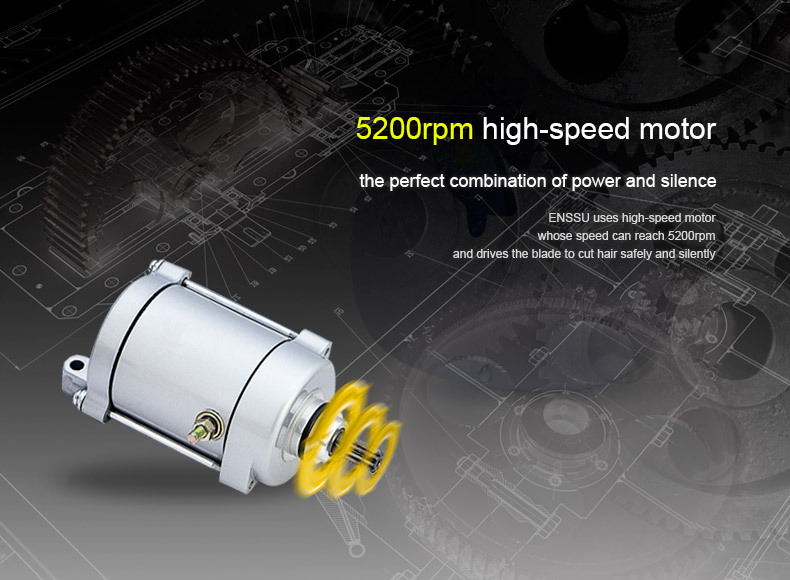 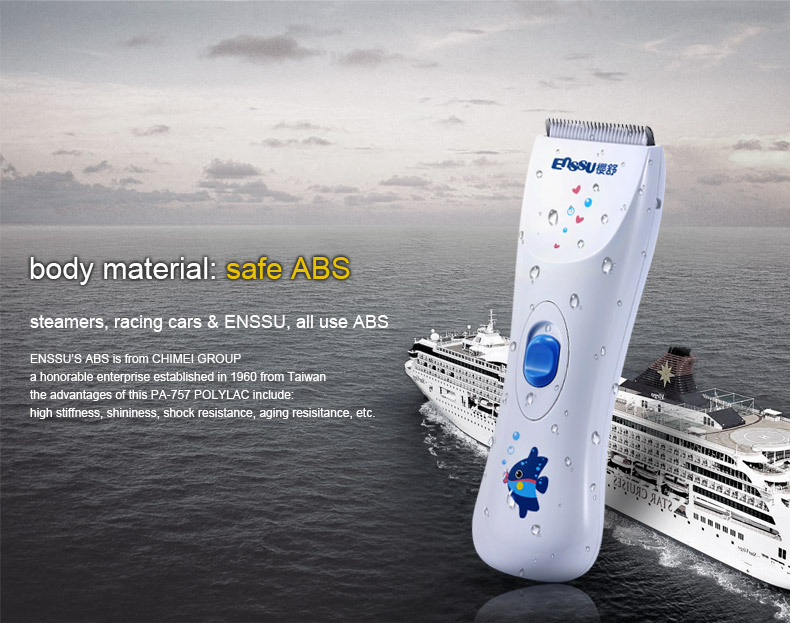 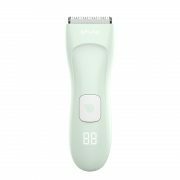 It adopts ABS eco-friendly material for its body and equipped with a high-power motor, Such a high power provides a strong drive to make the clipper not get stuck while working. 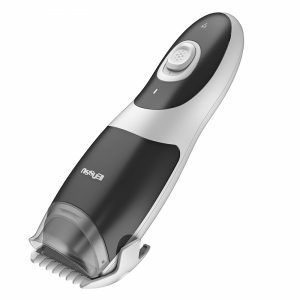 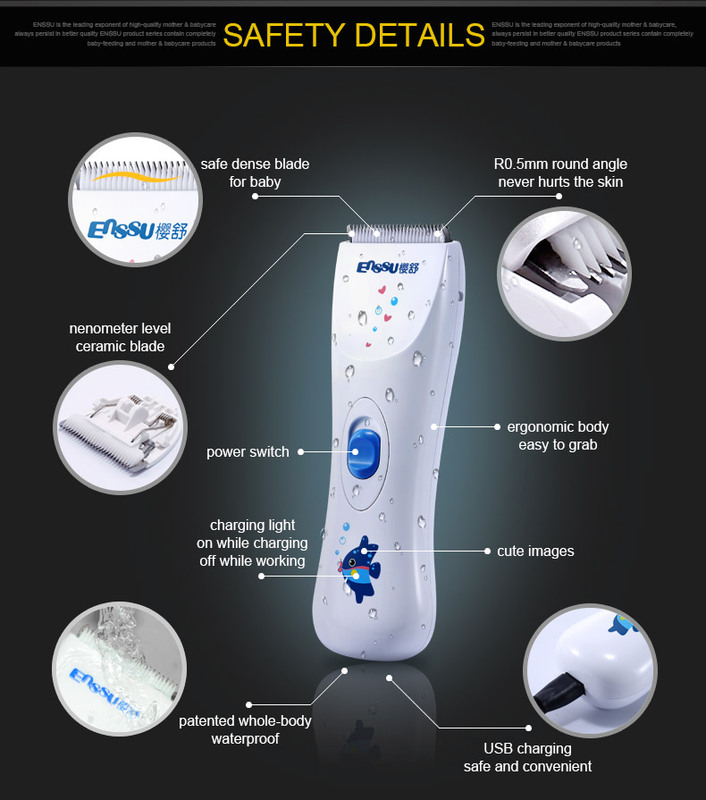 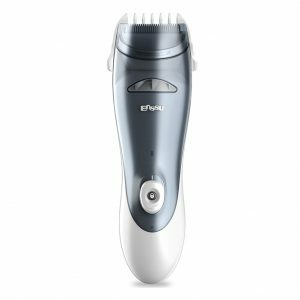 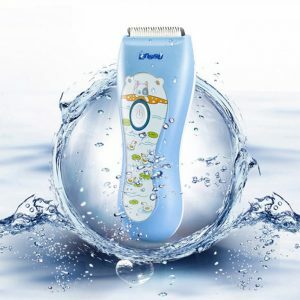 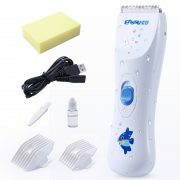 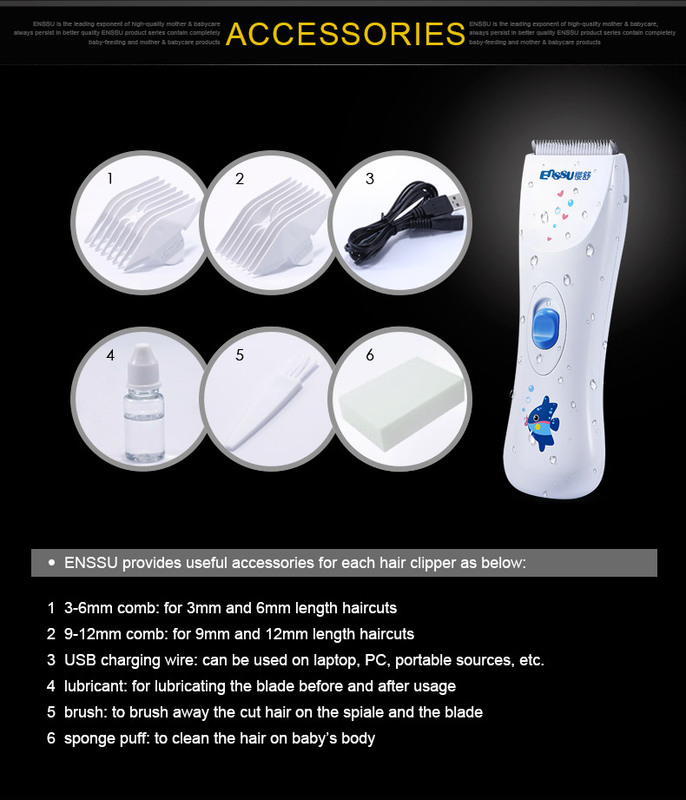 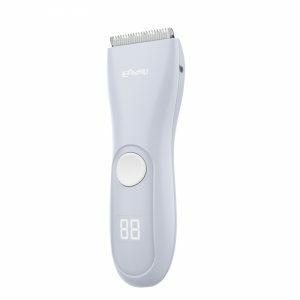 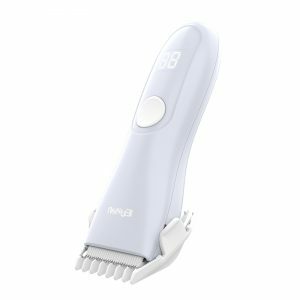 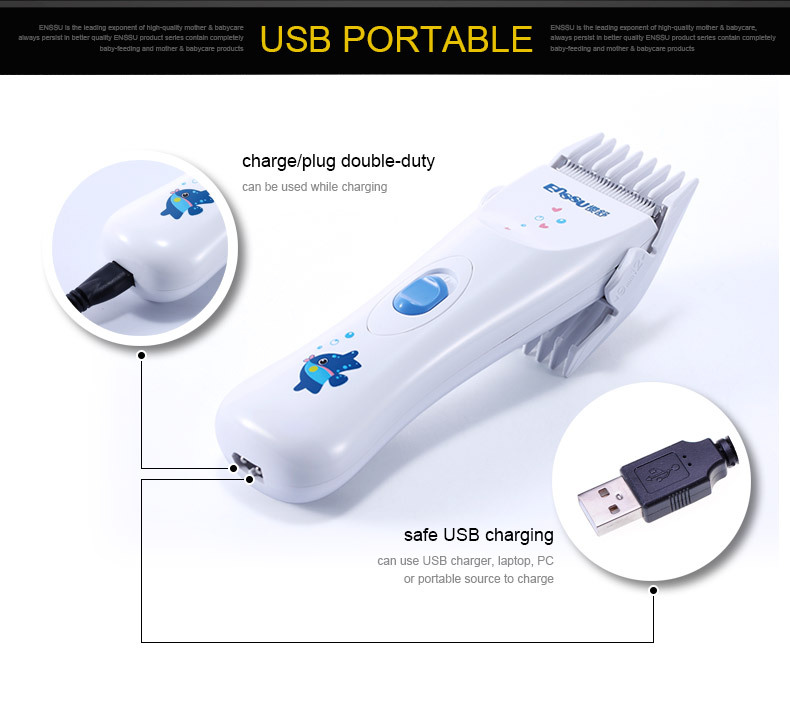 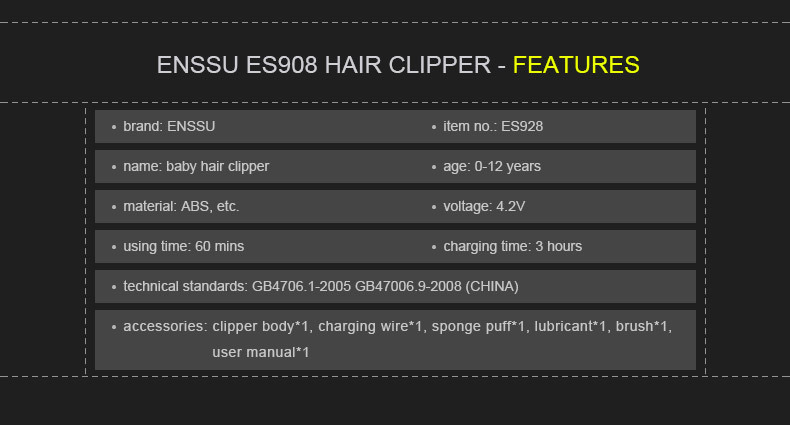 Comes with an USB charging cable, this baby hair clipper can be charged by desktop, laptop, portable source, etc. 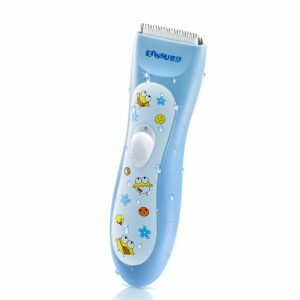 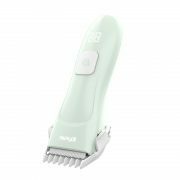 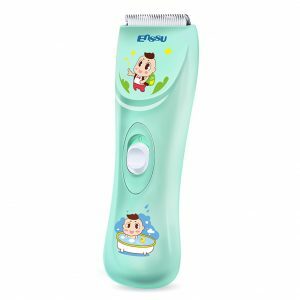 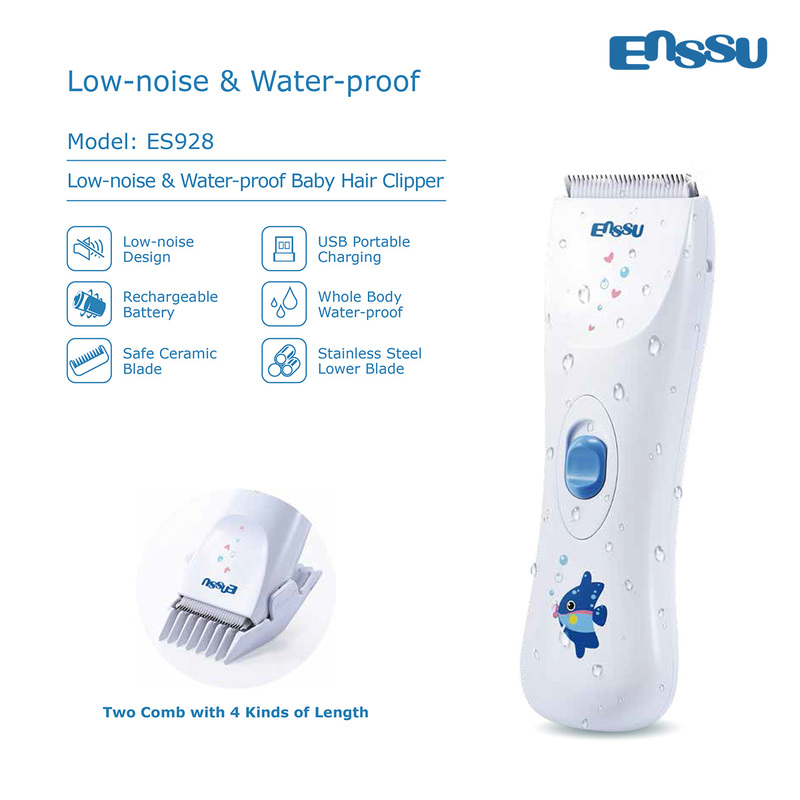 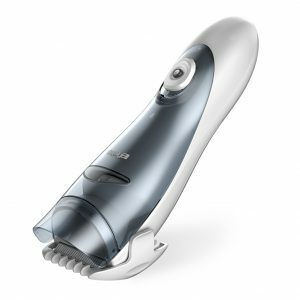 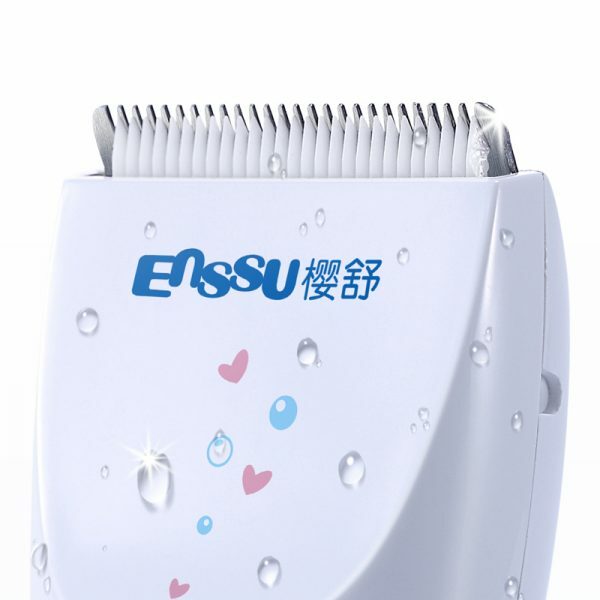 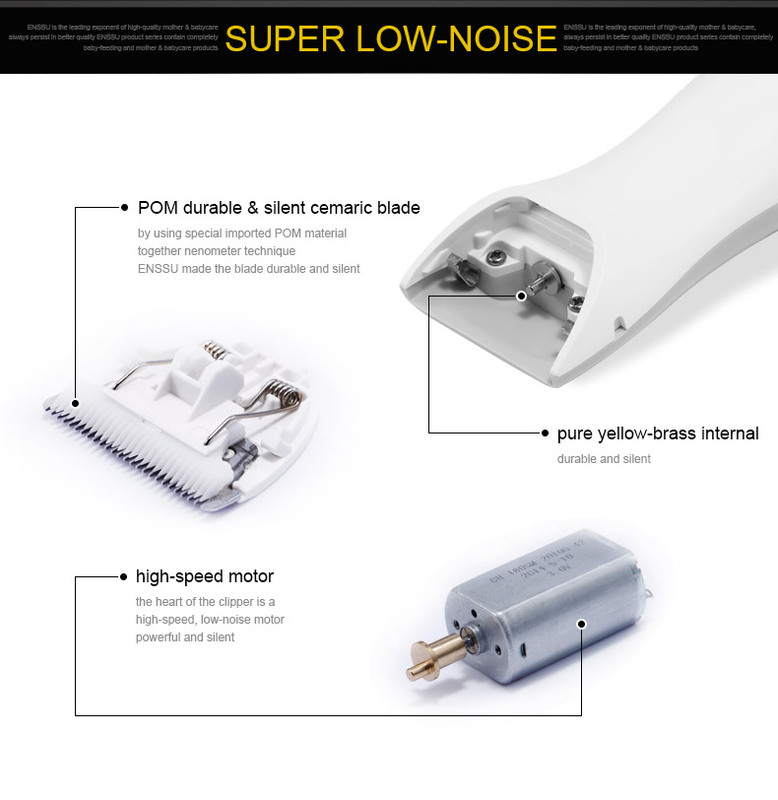 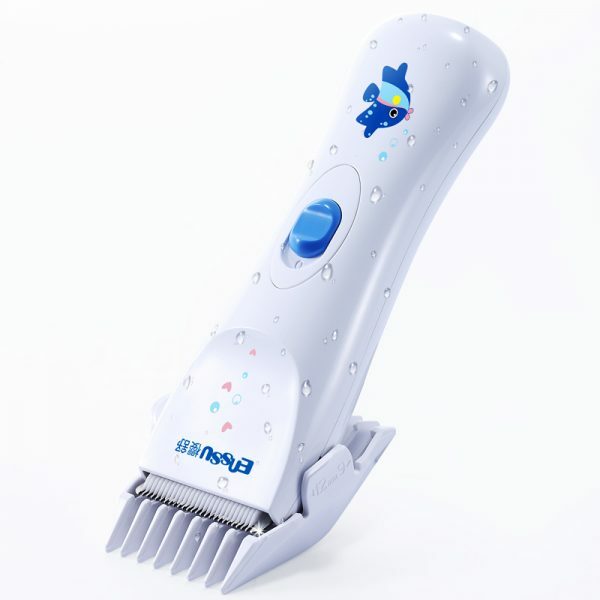 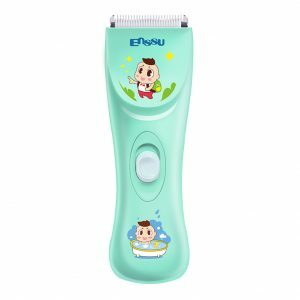 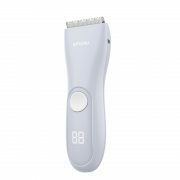 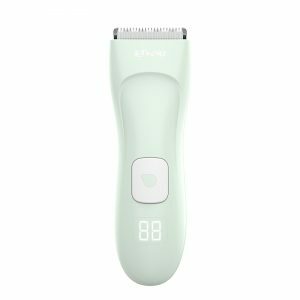 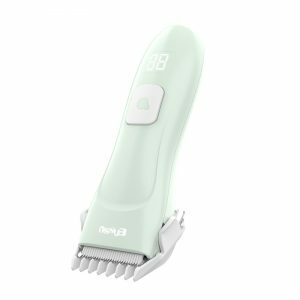 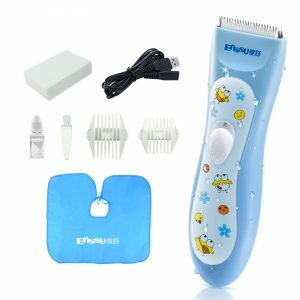 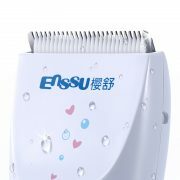 This ultra slient baby hair clipper has a low working noise which is less than 45db, making the babies no fear to the hair-cut. 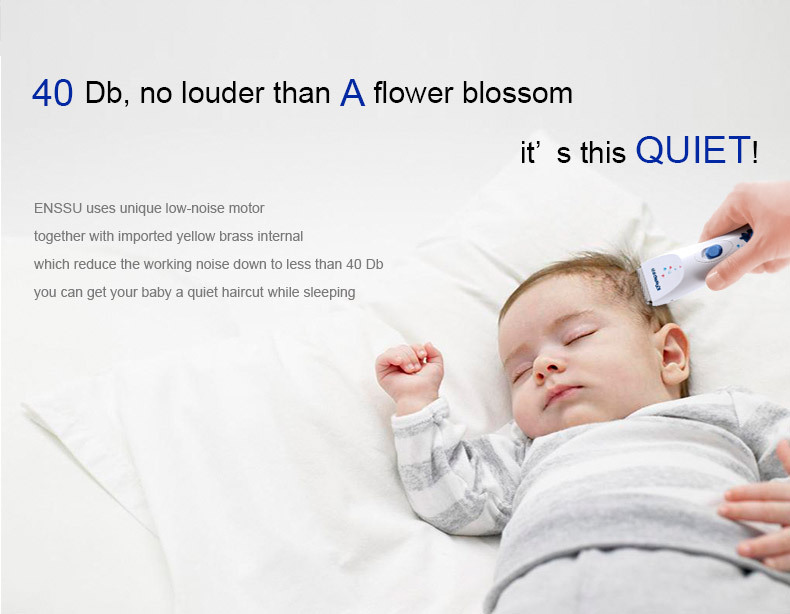 Also, the cordless capacity is so wonderful for the haircut and it will not wake babies up even when they are sleeping. 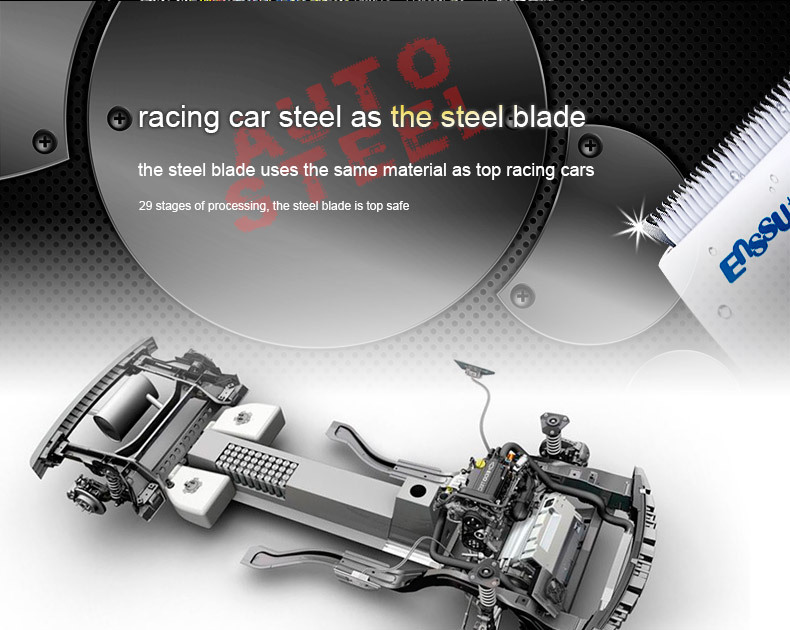 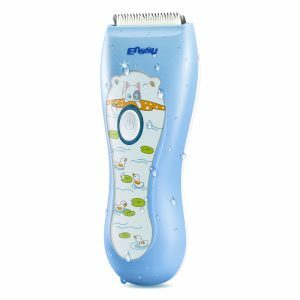 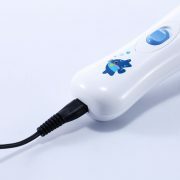 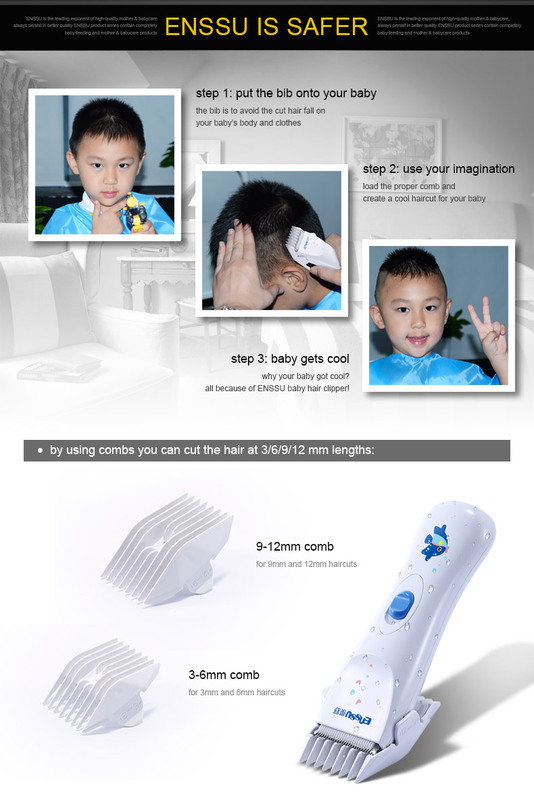 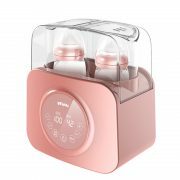 The sharp and clean ceramic blade is designed for 0-12 years old baby. 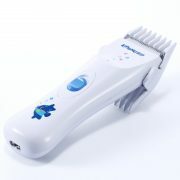 Easily to cut the hair without snagging or pulling of the hair. 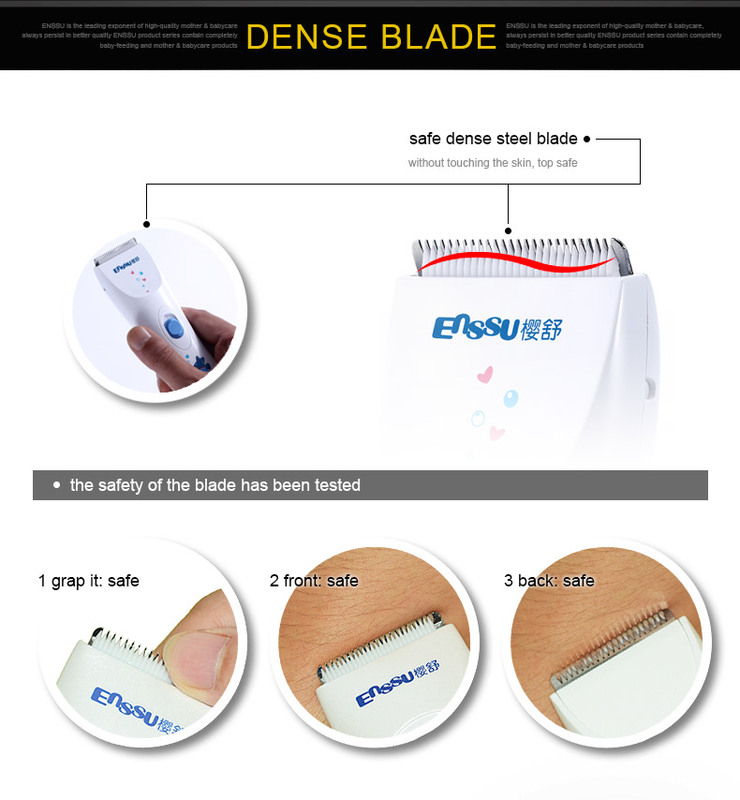 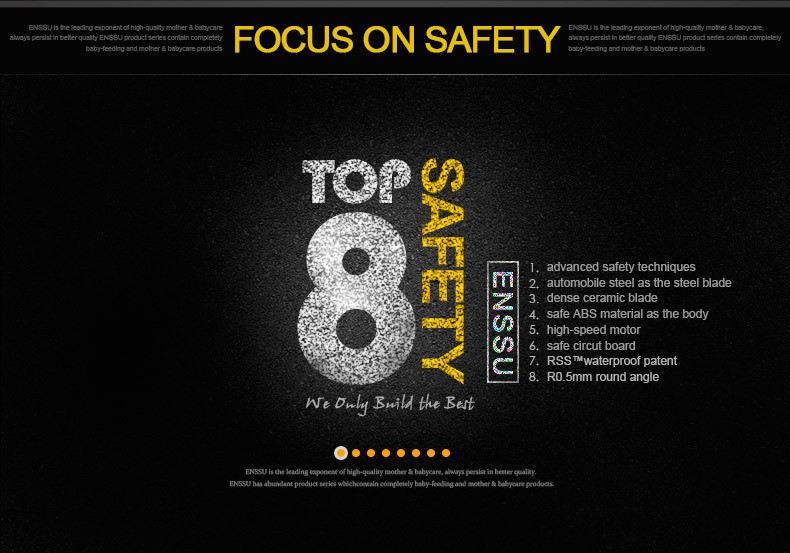 With 0.5mm gap to the skin offers full protection to avoid getting hurt. 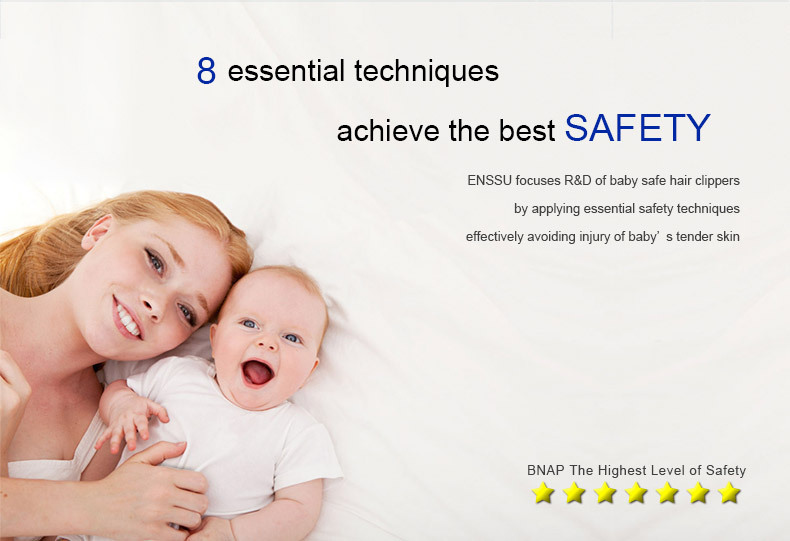 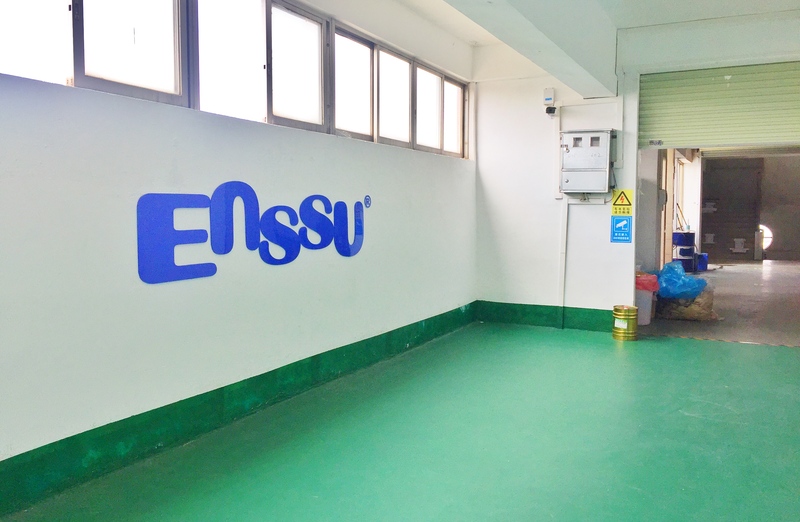 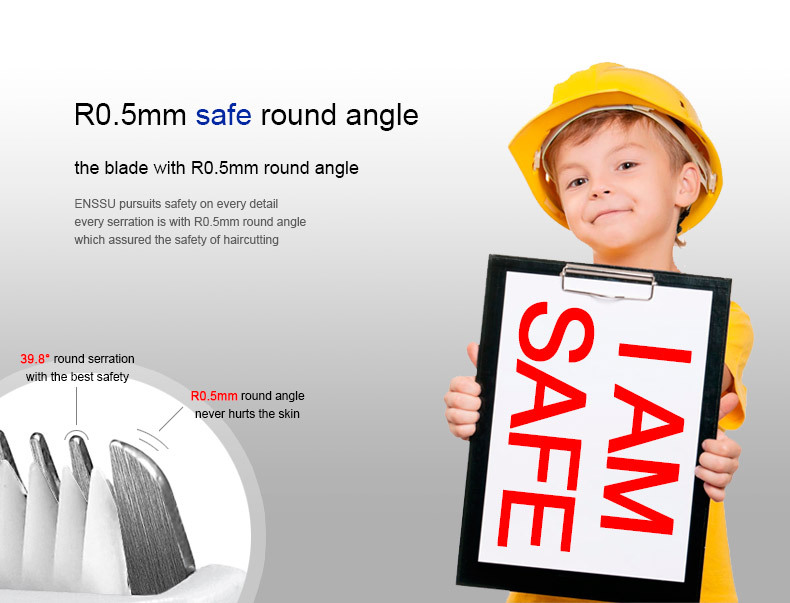 Although the fan do no harm to the fingers, we still design a child lock for double assurance.